Houses and other buildings are every bit as complicated as a car, a computer or other complex system. The study of the various disciplines at work and how your home (or other buildings) behaves as a system is called building science. With winter coming, here is a list of some of the important building science items you might want to consider for your home before the snow flies. GET RADON OUT of your house. Radon is the second leading cause of lung cancer in the U.S., and the Maine CDC estimates that a third of Maine homes likely have radon levels above the U.S. Environmental Protection Agency’s recommended action level. In Cumberland County, that estimate rises to 66%. Fortunately, it’s simple to test for radon levels (which can change over time) and fall and winter are ideal times to do it. The EPA considers 0.4 pCi/L a safe level of exposure. Learn more at maineindoorair.org/radon. AIR SEALING is responsible for up to half of the heat loss in a typical home. It doesn’t matter how much fluffy insulation you have, because fluffy insulation (fiberglass or other air-permeable products) doesn’t block air flow. Most air leaks in down low and exits high on your house. So, start by addressing the basement and attic. Standard bulkheads leading to basements often are not airtight or well-insulated. Install an exterior door at the entrance to the bulkhead. Then, use high-quality acrylic tapes, sealant and/or expanding foam to seal the first-floor framing to the foundation walls (assuming they are concrete). If the foundation walls are stone, the best approach is usually to spray-foam them from the interior, which provides air-sealing and insulation in one product. Use sheet metal and fire-rated caulking to seal the chases around chimneys, both at the basement and at the attic. And make sure any lighting fixtures adjacent to cold spaces (such as the second-floor ceiling in a two story home with a vented attic) are listed as airtight fixtures, and consider covering them with an air-sealing “hat,” because even airtight fixtures aren’t really airtight. Use tape or expanding foam around any wires drilled through from walls below. Seal around windows and doors. Efficiency Maine offers rebates for both air-sealing and insulation, as well as a list of qualified vendors to help you. (Editor’s note: the resource pages at the back of this magazine list some of the best). Learn more at efficiencymaine.com. INSULATION slows the heat escaping from your home in the winter. Insulation is measured in R-value, and recommendations include at least R-10 continuous insulation on basement walls (or R-13 between studs, but don’t use fluffy insulation alone for basement walls unless you want to risk moisture problems); R-20 in exterior walls (or R-13 between studs with R-5 continuous exterior insulation, or at least 38% of the walls’ R-value on the exterior to reduce the risk of moisture problems); and R-49 in roofs as the minimum to meet Maine’s building code. One of the most important areas of a house to insulate is the basement or crawlspace walls. A closed cell spray foam or rigid foam is recommended material in the basement. (Note: many foams have blowing agents that are potent greenhouse gasses, aka carbon polluters. So choose more environmentally-friendly ones if possible; ask for HFO-blown, 2# spray foam, and use EPS or Polyisocyanurate foam, not XPS—the only type that is usually blue, pink or green.) If you are re-siding or roofing an existing home, consider adding exterior insulation, though there are well-researched rules to follow to create safe assemblies. If you have an attic, blown-in loose insulation leaves fewer “thermal bypasses” (aka gaps) than fiberglass batts. WINDOWS get a lot of attention, and many older windows need a tune-up. Despite what window salespeople may tell you, it rarely makes good financial sense to replace a functioning window, which may only save a few dollars’ worth of energy per year. There are, however, other reasons to install new windows, including comfort, appearance, lack of lead paint, mold resistance and ease of operation. If you have old, single pane windows, be sure to install a storm sash for winter. If you’re installing new windows, consider one of the many triple-pane options available in Maine, including some manufactured in Maine or nearby. Others, imported from Europe, are surprisingly affordable, considering their high performance levels. HEAT PUMP WATER HEATERS (HPWHs) are such a good investment that you may not want to wait for your existing water heater to die before replacing it. (Note: at time of printing, Efficiency Maine was offering a $750 rebate on them). Some gas-fired systems can approach the efficiency of a HPWH, but water that is heated by conventional electric resistance, or a home’s boiler-based heating system, use significantly more energy than a HPWH. HPWHs essentially air-condition the space they are in, so they need a large, warm space, preferably away from everyday activity. Many people are concerned about the “parasitic load” of HPWHs; in the winter, they pull heat (and dump cold, dry air) into a space you have already paid to heat another way, reducing the stated efficiency of the system. But in most cases, the energy impact of the parasitic load is very small, and for a large part of the year the cold, dry air is welcome. So heat pump water heaters are usually a smart choice. 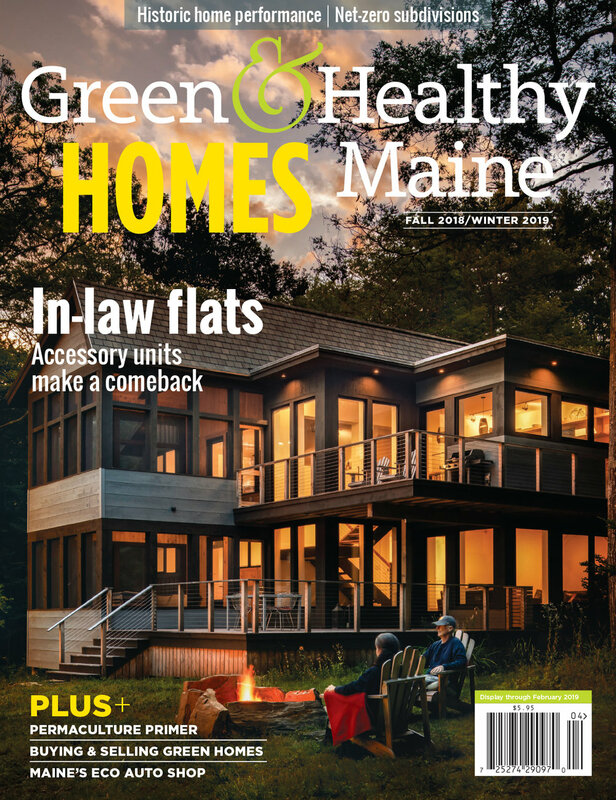 This article is reprinted from the 2018 Fall/Winter issue of Green & Healthy Maine HOMES. Subscribe today!